UDUPI - A noted Vaishnava Centre UDUPI - A noted Vaishnava Centre - Shiva Maha Purana, Vishnu Purana, garuda purana, bhavishya purana, skanda purana. 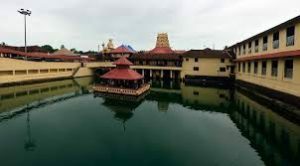 Udupi, a flourishing town on the west coast of Karnataka, very near Mangalore, is the seat of Lord Krishna and a holy pilgrim centre for all Hindus, particularly for the Madhva followers. It is famous for the Krishna temple, which was established here by Sri Madhvacharya, the propounder of Dwaita philosophy, who flourished in the 13th century. Nestling among coconut groves, with Malpe beach, one of the loveliest beaches on the west coast, very close to the town, and the blue range of western ghats which line like stately sentinel to the east, Udupi, like many other towns on the picturesque west coast, is indeed a beautiful place. The name ‘Udupi’ goes back to the famous temple of the moon-crested Chandramouleshwara which existed even prior to the coming of Sri Madhvacharya to this place. ‘Udupa’ means Moon, and the story goes that the Moon was cursed by Daksha, his father-in-law, while he was performing penance at this place by the side of the Chandra Pushkarini lake. It is said that the Moon got rid of his curse after propitiating the deity Chandramouleshwara. This locality is also known as ‘Raupyapitha’ in the ancient Parashurama Kshetra. The legend says that this strip of coastal land from Gokarna to Kanyakumari was reclaimed by Parashurama from the ocean. King Rama Bhoja performed a sacrifice at this place and the sacrificial altar came to be called as ‘Raupyapitha’. A visit to Udupi will always be a rewarding experience. The town has a long history. It attracts thousands of devotees and visitors throughout the year. They come from all parts of the country to have ‘darshan’ of Lord Krishna whose idol, according to legend, was installed in this famous temple by Sri Madhvacharya about 850 years ago. He is reputed to have discovered the idol of Sri Krishna from a ship which he saved miraculously from the clutches of a fatal storm blowing on the sea at Malpe. There is an interesting story relating to the discovery of this idol of Sri Krishna. According to the legend, it is said that this idol of Sri Krishna was being worshipped at Dwaraka by Rukmini, wife of Krishna in the ‘Dvapara Yuga’. This idol was made of ‘Salagrama’ stone and considered to be very sacred, as it represents ‘Bala Krishna’ in child form. With his right hand, he holds the churning rod and with his right hand he holds the rope. After Dwaraka was submerged in the ocean, this idol, in course of time was totally covered with a kind of white mud called ‘Gopi chandana’. The story goes to say that when a ship was sailing from Dwaraka, it needed some heavy load as ballast to balance the ship. The Captain of the ship picked up at Dwaraka a large heavy lump of hard mud and transferred it to his ship as ballast. When the ship came near Vadabhandeshwara at Udupi, the ship was caught up in heavy storm. Madhvacharya, who happened to be near the sea shore at that time, and seeing the ship in danger, he stopped the storm by waving his upper cloth and thus saved the ship from sinking. On landing at Malpe, the Captain of the ship came to the Acharya and prostrated before him and thanked him immensely for miraculously saving the ship. As token of gratitude he requested the Acharya to take anything from the ship as a gift. As if prompted by intuition, the Acharya asked for the lump of the mud-covered ballast that was in the ship. From the point of the Captain, it was only used as ballast and would be thrown away after reaching the port. As such, he readily handed over the lump to the Acharya. To the great delight of every one, the beautiful idol of Bala Krishna was found inside that Gopichandana mud. The Acharya carried the idol to Udupi, washed it in the ancient tank nearby (which later came to be known as Madhva sarovara), and enshrined it in a small temple near the time- honoured Chandramauleshwar temple, composing extempore and singing ‘Dwadasha Stotra’ in praise of the Lord. Thus, the original Udupi Krishna temple was consecrated by Madhvacharya. He made arrangements for the regular worship of the deity. In the beginning, Madhvacharya had arranged that the eight bachelor swamijis whose Mathas he established in the new car street around the temple, should worship Sri Krishna by rotation, for two months so that each swamiji’s turn would come once every eighteen months. This practice of worship continued for many years. It was during the time of Sri Vadiraja Tirtha, the head of the Sode Matha, that the ‘Paryaya’ system of two years was introduced so that the turn of each swamiji would come after sixteen years, during which time, the Swamijis could tour and propagate the tenets of the founder’s philosophy. Pajaka Kshetra, an ancient village located 11 kms. south of Udupi was the birth place of Sri Madhvacharya. The Acharya was born to Narayana Bhatta and Vedavathi or Savithri on Vijaya Dashami day in 1238 A.D. He was named Vasudeva and after the usual ‘samskaras’, studied at the Anantheshwara temple at Udupi. At the age of twenty one, he took ‘sanyasa’ from Achyuta Preksha Tirtha and later came to be known as Madhva and also by the other names of Ananda Tirtha, Poorna Pragna and Sravajna. He lived for 79 years and disappeared on 9th Magha in Badarikashrama. According to some, it is said that Sri Madhva passed away while he was participating in a discourse in the Ananteshwara temple. The original biography of Madhvacharya is written in the traditional orthodox style in ‘Madhva Vijaya’. Another popular biography called ‘Manimanjari’, written by Pandita Narayanachar, gives fanciful story of a demon called Manimat. The writing portrays a strong enmity between the followers of Madhava and Adi Shankara. It is stated that Madhvacharya had learnt the systems of twenty two other ‘sampradayas’. The Acharya has written commentaries on Brahma Sutras, Upanishads and the Bhagavat Gita. His book ‘Gita Tathparya’ is a summary of Gita expounding Dwaita philosophy. He has also written commentaries on Srimad Bhagavata and Mahabharata. According to him, the Vedas, the Panchrathra agamas, the Ramayana, the Mahabharata and the Brahma Sutras are the only authoritative works on Hindu philosophy. Madhvacharya was one of the greatest intellectual sons of our country, and has a great following in South India as well as in the North. The tradition established by Madhva by giving monastic order (sanyasa) to eight bachelor disciples began with the individual Mathas around the main Krishna temple at Udupi, wherein each of them was worshipping different idols of Vishnu given to them by Madhvacharya. These are, Palimar, Adamar, Krishnapura, Puttige, Sirur, Sode, Kaniyur and Pejavar Mathas. The deities presented to these Mathas by the Acharya were Sri Rama, Kaliyamardana Krishna, again Kaliyamardana Krishna along with Narsimha, Vittala, Vittala again, Bhoo Varaha, Narasimha and Vittala respectively. Sri Vadiraja Tirtha of the Sode Matha in due course became I lie Swamiji in his turn to worship Krishna. He was the must honoured personality after Madhvacharya and was the eighteenth in succession of the Matha. Born in 1480 A.D., at a village neai l ItIupi, he became a learned scholar and won the title ol ‘Sri Gumraja’. Originally, the worship of Krishna at the temple was by turns of short ei intervals. Sri Vadiraja introduced the system of worship by the eight Mathadhipathis in turn, once in two years. On account ol this change, the Swamiji worshipped in the Krishna temple fot a period of two years and then it was continued by another Swamiji. This change-over takes place in the month of January February, usually on the 17th or 18th every second year. This period of change-over is considered as an important festival in Udupi, known as the ‘Paryaya’ festival. The Paryaya festival is the biggest festival in Udupi. Disciples of the Madhva cult congregate from all part of India. Naturally, very elaborate preparations are started several months prior to this day. New plantain shoots are planted to provide the leaves and fruits. Seven months before the Paryaya day, the collection of necessary firewood, rice, provisions, etc., are arranged for the function and stocked in separate rooms. The firewood collected would be piled around a central pole and when completed, the heap of firewood looks like a chariot rising to a height of more than 12 metres. On the night prior to the installation, the Swamiji to be installed visits the Danda Teertha about 16 kms. to the south. Early in the morning after the ‘Pooja’, he proceeds in a procession to ‘Jodukatte’ near the Taluk Office, where the Swamijis of the other Mathas welcome him in the order of seniority in age and lead him to the premises of the main temple. All of them pay their obeisance to the Lord through the Window’ pc >pularly known after Kanakadasa, the famous musician saint contemporary of Vadiraja Swamy. The Swamijis then proceed to the Chandramauleshwar .md Anantheshwara temples before entering the Krishna temple At the gate, the outgoing Swamiji welcomes his i nrom mg Im>t her Swamiji. All the Swamijis then proceed to the Madhva Sarovar where they wash their deities and things before entering the temple. They gather inside in the vast space in front of the ‘sanctum sanctorum’; the new comer worships the deities brought with him, offers respects to Mukhya Prana Deva opposite, and he is himself honoured with sandal paste by the other Swamijis present. Ascending the ‘Sarvajna Peetha Simhasana’ in the presence of all the Swamijis and devotees, he proceeds to ‘Badagu Malige’ or northern portico where all the Swamijis gather in a conference. The newly installed Swamiji offers sandal paste and worships the brother pontiff in the presence of the assembly. A public announcement to the effect that the new pointiff has taken over charge of Krishna’s worship for the next two years is made. At the same time the names of the new assistants to the Swamiji to discharge various duties are announced. Flowers and fruits are then distrubuted. The Swamiji then enters the ‘sanctum’ in the presence of the idol of Sri Madhva and receives the ‘Akshaya Pathra’ and other insignia, seals, etc., of office from the outgoing Swamiji. Then the outgoing Swamiji is led to his Matha in the car street with all the temple honours. After these funcitons, the new Swamiji conducts the daily ‘pooja’ to Krishna followed by feeding the participants and guests. In the evening a number of processions such as Teppothsava in Madhva Sarovara, procession in the Golden Palanquin, etc., take place. Brahma Rathothsava and the procession in the Golden chariot take place on the last day in great pomp and glory. All these functions provide a grand and unforgettable sight. Lakhs of pilgrims and devotees assemble during this period. The temple of Sri Krishna is comparatively a small structure which has not changed much over the several years of its existence. The main entrance to the temple leads to a sacred pond on the right side called Madhva Sarovara, which is used by devotees for bathing before entering the temple. Well- cut stone steps are laid on all the sides to facilitate large number of devotees to use the sacred pond. In the olden days, it was known as Viraja Teertha and Anantha Saras. Outside the wall that encloses the main shrine and the famous Madhva Sarovara, there is the ‘window’ which has nine square holes, the surface of which is decorated with silver sheets sculptured with twenty four forms of Lord Krishna. This is the ‘Navagraha Window’. Local legend associates this ‘window’ with Kanakadasa, a low caste devotee of Lord Krishna, who later became famous as a Haridasa along with Purandaradasa. According to the story, Kanakadasa was refused entrance into the shrine on account of his low caste, and he offered prayers standing outside the temple on the western side. Moved by the devotion of Kanakadasa, the idol of Krishna which was facing the Madhva Sarovara till then, miraculously turned its face to the west where Kanakadasa was praying. Suddenly, a large opening also appeared in the wall to provide the view of Lord Krishna. Thus, Kanakadasa was able to have ‘darshan’ of the Lord through the opening. A lamp with ghee-fed wick is constantly burning in the ‘sanctum’. It is said that this lamp was first lighted by Madhvacharya when the small shrine was opened for the deity. Daily the idol of Krishna is worshipped nine times. At four in the early morning, the conch (shankha) sound announces the opening of the shrine. The drums at the main gate are sounded to inform the devotees. The doors of the ‘sanctum’ are opened and the first prayers are offered followed by Nirmalya pooja, Usha kala pooja, Panchamritha abhisheka pooja, Udhvarthana pooja, Kalasha pooja, Teertha pooja, Alankara pooja, Avasara pooja, and Maha pooja. The devotees are informed about the poojas by the varying rhythmic notes of the drum (nagari) on the main gate. Every day at noon, a grand meal ‘prasada’ is served to all the visitors without any restriction of caste or creed. Recently, a beautiful Geetha Mandira building has been constructed within the temple enclosure to propagate the teachings of Bhagavad Gita. The inside walls of the hall are decorated with marble slabs inscribed with the verses of Gita on them. This is an excellent place for peaceful meditation. Apart from the famous Krishna temple and the eight Mathas, there are a number of other places which a visitor to the town should see. A visit to Malpe is a must for any visitor coming to Udupi. This quiet beach is an ideal place for a swim. There is a chain of islands out in the sea forming a natural protecting girdle to the Malpe port. Some of them are very picturesque, especially Bahadurgad. The nearby St.Mary’s Island is connected by a boat service. With swaying palms, huge columns of basalt rocks, and the sea frothing and foaming nearly, it makes an ideal picnic spot. Onthe sea shore there is a temple called Vadabhandeshwara associated with Sri Madhvacharya. Along the coast 10 kms. away is the famous Kaup Lighthouse. A small village called Kunjar about 11 kms. from Udupi is the birth place of the great Acharya Madhva. Kollur, the famous pilgrim centre of Mookambika is only 80 kms. away. As one drives north along the coastal road to Maravanthe, 50 kms. from Udupi, a beautiful natural surprise awaits the visitor. The highway bordered on either side by the sea and a river, with a backdrop of Kutachadri hills, makes the drive an exhilarating experience. And at sunset, a crimson sky and the river convert Maravanthe into a fairyland of scenic beauty. At Barkur, 20 kms. from Udupi, are the ruins of an ancient kingdom. Mangalore has the nearest Bajpe airport to visit Udupi which is only 36 kms. away. Udupi is now connected by the coastal railway line with Mangalore. Excellent transport services connect Udupi with most of the important cities in Karnataka, Kerala and Tamilnadu. There are very convenient lodgings and economy class hotels at Udupi to suit the budget of the visitor. In addition, the eight Mathas around the Krishna temple, maintain choultries for the pilgrims and visitors. Local buses, autos and taxi service are available for sight seeing around Udupi.